It’s always so nice to get a break from actually driving yourself. 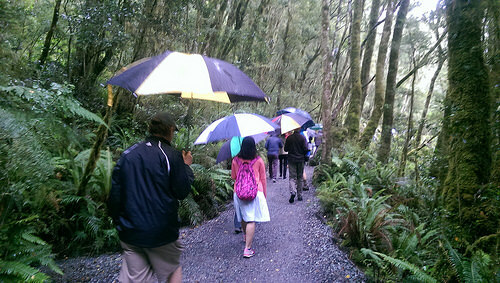 The Milford Sound guided day tour with Trips & Tramps provides a great opportunity for this. Their vans are modern and air-conditioned. This is a small group tour, so you won’t be sharing with a lot of people. On the day we did this tour, we were collected from Te Anau. 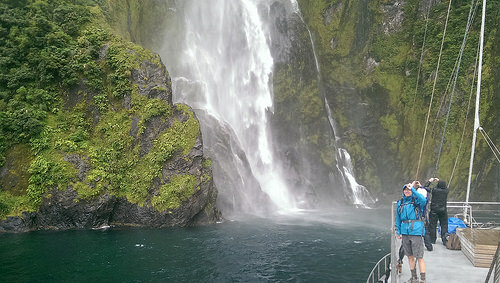 It was drizzling, but in Milford Sound this is actually a bonus! When it rains, the waterfalls are sensational. Note also how to get from Queenstown to Te Anau. Every seasoned traveller knows that the weather doesn’t always go according to plan and sometimes it rains. 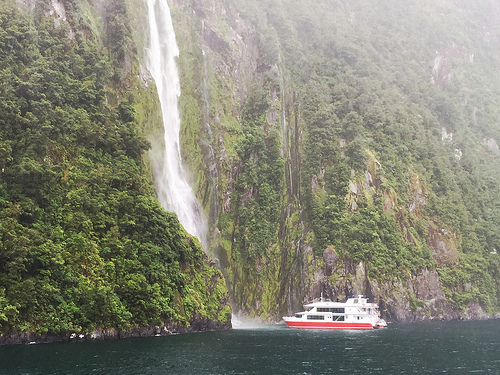 But in Milford Sound, grey days really make the colours pop! And the whole area becomes shrouded in a type of mystical beauty. Dull skies contrast with the vibrant greens the native bush and rain produces cascading waterfalls. 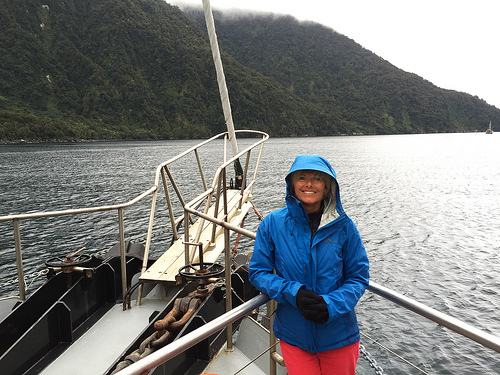 The Milford Sound guided day tour starts with a 2-hour ride from Te Anau into a magical kingdom. There are a couple of toilet and photo stops stops on the way – that’s always a comfort. 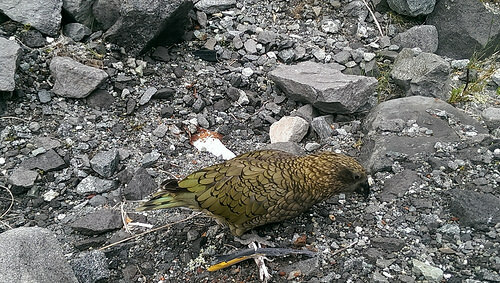 Now on this guided day tour, we guarantee you’ll catch up with those cheeky Kea birds. 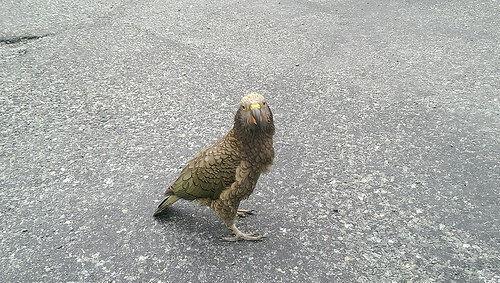 These parrots are lovable but to be aware, they are thieving rogues – do not be seduced by their winsome personalities. They wait until you’re out of sight, then set about destroying every windscreen wiper they can see! To know them, is to love them – just never trust ’em. Yes, I’m talking to you, my fine feathered little friend! 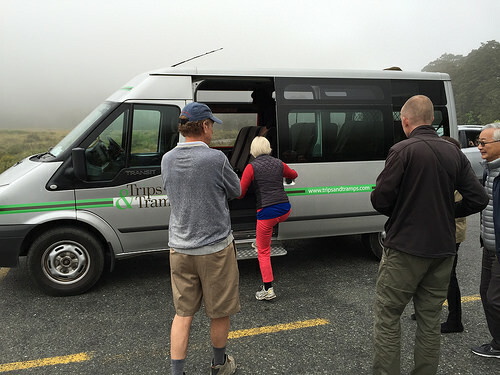 For these types of tours there are various connections. As you can imagine, timing is crucial. Our guide was very happy to be the first van to arrive for our cruise on the Mariner vessel. 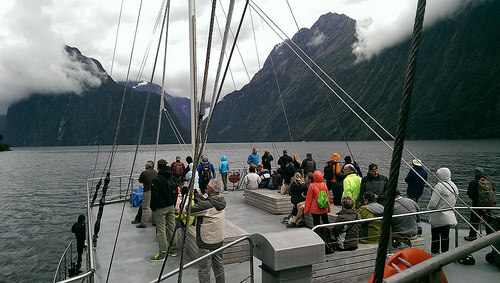 This part of the tour includes a 2-hour 30min cruise of Milford Sound Admittedly, you’ll find a bit of mass tourism on this boat, but you won’t feel crowded in. The vessel is large and the sheer scale of the scenery is a great distraction. 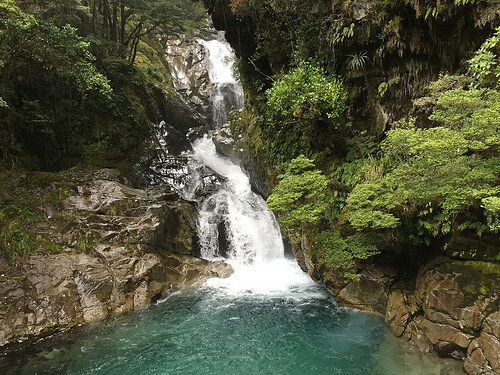 An alternative is Doubtful Sound. Its easy to secure a strategic spot for photos and you can pop into the large dining area at any time to eat and warm up. You’ll probably won’t be indoors for too long – especially with sights like this just around the corner. The sound of these waterfalls cascading down is awesome. Once you arrive back on land, everyone boards the Trips and Tramps Van. 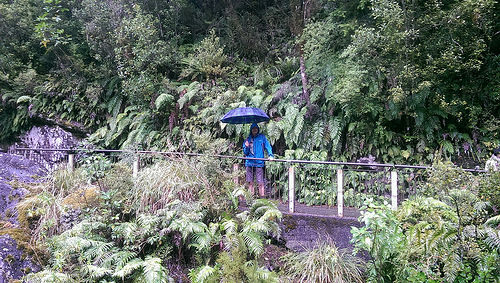 Then we’re off to do the Chasm walk – such a lush area of punga ferns. You’ll get to see some beautiful sculptured rock forms. Its a mesmerizing sight to see layers of water coating them to a glistening shine. In the land down under, you can get taste of 4 seasons in one day. On this particular day, we could see that some travellers were prepared – they were wearing the correct shoes and had wet-weather gear. Others were not prepared as much. wearing Jandals or open sandals are downright dangerous. There are a few stops that will delight you. One of these is the Homer Tunnel and the Key Summit track. The Key Summit track can be very cold to walk on a day like this. 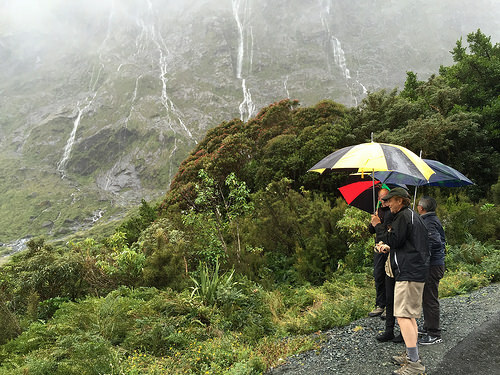 The Milford Sound guided day tour will give you a great introduction to the Milford Sound area. You don’t have to do any driving and you’ll get to see a part of New Zealand that has not changed since the days of Captain Cook.